Sometimes you just get lucky. 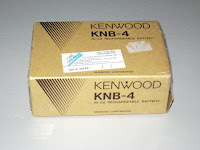 After I repaired the TH-205E I recently won on eBay, I was looking around for ideas on what to do about the dead battery pack and I found someone selling brand new Kenwood KNB-4 battery packs for £2.40. Well, not brand new, but never used, in the manufacturer's box, though they would have been manufactured some time around 1993. The seller claimed that, although stored for a long time, after three full charge / discharge cycles they should be capable of holding a reasonable charge. The KNB-4 was not actually made for the TH-205E. 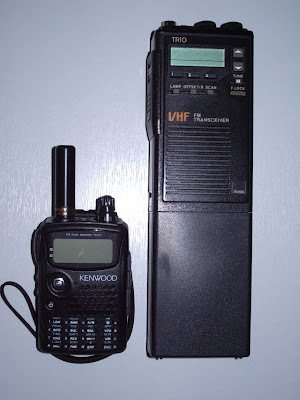 However due to Kenwood keeping the same form factor for its hand-held transceivers for several years the newer battery pack is able to be used in the older radio, as I was able to confirm from the W&W Manufacturing website, which claims it is equivalent to the PB-4 accessory battery for the TH-205. This is the large "high capacity" battery, with 1500mAH capacity as compared to the 500mAH of the one that came with the radio. Unfortunately it is only 7.2V which gives a power out of 1.5W according to the manual. It would have been nice to have had the 12V 1200mAH one which gives 5W out but you can't have everything. This is a big battery pack and it turns the already large TH-205E into a veritable giant, as the picture of it next to the TH-F7E shows. This is more than just a radio! You give your biceps a workout every time you use it. The radio will hold down your log sheets on a windy hilltop where lesser rigs would blow away and it also makes a handy weapon to beat off any assailants who might try to mug you whilst you are on the air. Unlike the supplied battery, the KNB-4 doesn't have its own charging socket, just contacts for a drop-in charger. So I will need to make a drop-in charger for it. I have already made a start using a piece of Veroboard with contacts made from a paperclip. The battery is charging at 240mA from the shack power supply, so after 10 hours I'll know if it can hold a charge. If it does then I'll make up a proper constant current charging circuit and put it in a nice box. Then I'll have a great little, err, I mean great big 2m radio that will certainly attract a lot of attention wherever it goes!